In This Heart of Mine, you met Kevin Tucker. Now meet Kevin's shark of an agent...and Annabelle Granger, the girl least likely to succeed. With his money-green eyes and calculated charm, Heath Champion is the best sports agent in the country. He's wealthy, driven, and gorgeous, so why does he need a matchmaker, especially a red-haired screw-up like Annabelle Granger? True, she's entertaining, and she does have a certain quirky appeal. But Heath is searching for the ultimate symbol of his success: the perfect wife. And to make an extraordinary match, he needs an extraordinary matchmaker, right? If Annabelle isn't careful, she just might find herself going heart-to-heart with the toughest negotiator in town, a man who's beginning to ask himself...exactly how perfect does perfect have to be? ©2005 Susan Elizabeth Phillips (P)2005 BBC Audiobooks American & © 2005 HarperCollins Publishers, Inc. I don't know what prompted me to download this audiobook and start listening to it. Maybe I was in a funk and wanted something light to cheer me up? Or maybe it was recommended on one of Audible's editors' lists? It's not the kind of book I go for. It's fluffy and sweet - a predictable romantic comedy with a slightly annoying protagonist and a leading man whose name is "Heath Champion". Heath Champion. Seriously?! But despite all of this, and despite a female narrator who over reaches trying to capture the bravado of some of the male characters in the story, I really enjoyed the book. Once I was in, I was hooked. It was a great listen - that perfect romantic comedy that leaves you feeling cheered up and satisfied. 54 sur 54 personne(s) ont trouvé cet avis utile. 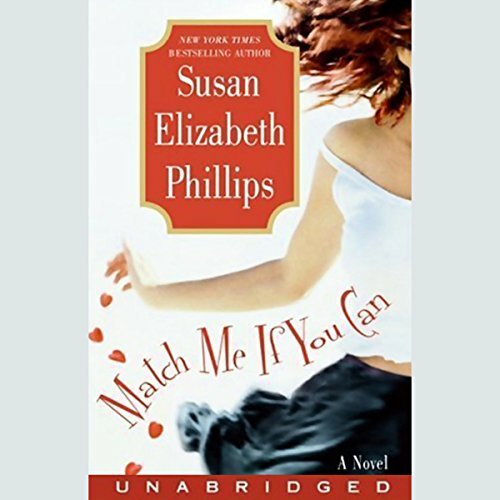 I have either read or heard nearly all of Susan Elizabeth Phillips' books and this is quite possibly the best book of this genre I have ever read. Susan is able to imbue her characters with her own wacky sense of humor and her ability to describe people and places is singularly remarkable, surpassed only by Stephen King. I thoroughly enjoyed Heath's meeting with Annabelle's family for dinner. By the end of the scene, I was forced to reevaluate my perception of her family (except for the snitty wife, of course). Now we get to the best scene of the entire book: Heath's encounter with "The Blue Lady". I call her that so as to not spoil the scene for those who have not yet listened to the book. Heath's initial reaction to her when he opens the door was exactly right and the rest of the scene was so hysterical that I rewound the CD twice and enjoyed it as much the third time as I did the first. I rarely find somthing to read or listen to that is "laugh-out-loud" but this certainly qualifies. My reaction went from a snicker to a chuckle and finally to laughter so loud that it brought my husband into the room to find out what was going on. This book contains everything I want in a good read: It's funny; it's entertaining and, as for holding my attention? More than enough left hanging at the end of a chapter to lure me on to the next one. Susan, keep it up. You're the best! Wonderful example of Susan Elizabeth Phillips' talent. Characters that you care about and ones that you'd like to meet. Heath Champion's hunt for a wife leads him to matchmaker Annabelle Granger. At first these two seems destined to be adversaries but just stick around for the sparks. Secondary characters provide a great additional love story. One of SEP's trademarks is re-acquainting us with characters we've met before. Phoebe, Dan, Molly and Kevin again charm the pages. A great story read by the incredible Anna Fields. A good listen. Kept moving, was very romantic without the intimate details. Funny, too. Like an Evanovich read. If you miss this book you will miss out on one of the best, fun, sweet, modern chick books ever! This is a laugh out loud and holds your attention. It is so right now and when you are having a bad day this is your back up. You can't stay unhappy with these characters. I love it. Thank SEP again. I love your books. What made the experience of listening to Match Me If You Can the most enjoyable? The characters are very engaging and the story flowed really well. Overall I enjoyed the book - I enjoyed the bantering between the two main characters. I thought Anna did a good job, however, and I know she is a woman, her male voices were not top notch. I bought the book on sale, so I am glad I did not spent a credit. Did not realize that is part of a series, although I think this book stands well on its own. I did not think it was very realistic that the main character knew all these "important and wealthy people", this did not really add up with her own private and financial life. Good story, but the ending was rather abrupt and not really developed, although not too terribly bad. I would recommend the book if you can get on sale. Although it's pretty predictable on how this will turn out, I still enjoyed going through the lives of these characters. Funny at times but it was still a roller coaster of emotions through out this book. Sometimes it's nice to have a fairy tale ending to make you feel good after. The characters are well developed; and as the story goes, just when you think you can predict the outcome, surprise, suspense, sadness and comedy will reel you in. This book is another fine example of the author's ability to create characters you quickly care about and a story line that is fast moving and unpredictable (despite a predictable ending). In a manner very much along the lines of "Ain't She Sweet", it is a delightful romp that would be fictional fluff except for the warmth of the humanity that comes forth from all the characters and the depth of character development shown by the majority of them. Pippi is a special delight, made so by the incomparable Anna Fields who does another remarkable narration. This book is a lot of fun and well worth reading on all fronts. Wie bei S.E.Phillips Büchern sehr vorhersehbar, brilliant geschrieben und dadurch ein Genuss von der ersten bis letzten Minute. habe das Hörbuch bereits dreimal gehört und es war sicher nicht das letzte Mal. Die Sprecherin Anna Fields ist einfach fantastisch! Gibt dem Hörbuch eine besondere Note! Hörenswert, wenn man leichte Literatur, mit einfallsreich Dialogen und Romanzen mag. Eine schöne Geschichte die wieder einmal zeigt, warum in die Ferne schweifen wenn das Beste doch so nahe ist. Hervorragend vorgelesen. Sehr zu empfehlen! I liked the characters and the story! It was the first SEP book I have bought and I just purchased the second one. Liked the speaker, but it took some time to get used to the male voices. Da ich schon einige Bücher von der Autorin gelesen habe, wollte ich mich mal an einer Audioversion ihrer Hörbücher versuchen. Ich muss sagen, ich war positiv überrascht. Die Geschichte ist fesselnd und die Sprecherin macht es einem leicht, sich in die Geschichte hineinzuversetzen. Wirklich zum empfehlen!